I know very few travellers who are not mad about mountains. Interestingly enough, most of those smitten with mountains are either sea-level-dwelling sun-worshippers or plainsmen (and women) from the hot, dry hinterland. What is it, then, about mountains that make them so awe-inspiring? 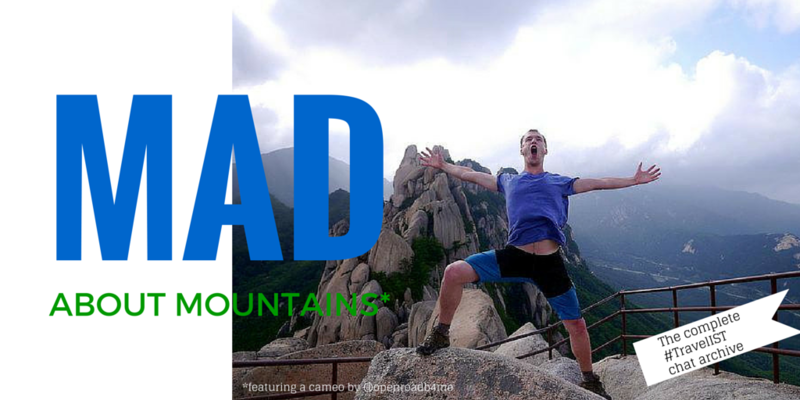 On last week’s #TravelIST chat we set forth to discover the exhilaration, joy and terror that mountains inspire in us. It turned out to be the biggest ever #TravelIST chat, trending on Twitter at No 5 in India with close to a hundred participants posting tweets, links and a record number photos. Great to know that most of our regulars are die-hard mountain maniacs, too. As fate would have it, Ankita co-hosted from mountainous Ladakh while Nathan and I hosted from Washington, USA and Bangalore, India respectively. Since Ankita Mahabir and I started #TravelIST in January 2014 (Nathan, a regular from the start, was roped in as co-host owing to his infectious level of enthusiasm), we’ve hosted a chat almost every week. We took a few holidays in between or invited guest-hosts to stand in for us. We even took a summer vacation, keeping the hashtag warm during our absence with a minichat! We’re grateful to have among our regulars some of the most widely travelled nomads, published travel writers, as well as influential travel bloggers and marketers. To those wet behind the ears, #TravelIST is a weekly travel chat on Twitter. It takes place at the hashtag #TravelIST, which means to participate and be seen, you must tweet into the chat with the hashtag (if you don’t, you will provoke the Hashtag Cop, my tough-talking alter-ego). #TravelIST takes place every Thursday at 8:30 pm IST (which is 3 pm GMT and 11AM EDT). For details such as topic announcements, bookmark our listing on Travelogx. Back to those mountains. Here’s the full archive of last Thursday’s #TravelIST chat.